Each military man and military serviceman is given relevant military rank depending on military services position, military or special training, and a period of military service, status in reserve, or type of troops of belonging or services. The higher ranks in Azerbaijan are conferred to military man serving at higher officer positions by the relevant authority. Conferring of military ranks to military man and military officials, as a rule, on turn basis in accordance with the Provisions on Military Service and as per requirements of the Disciplinary Statute of the Armed Forces of the Republic of Azerbaijan. Citizens in reserve will be called with military rank of «……..in reserve, retired citizens with words of retired………………….. 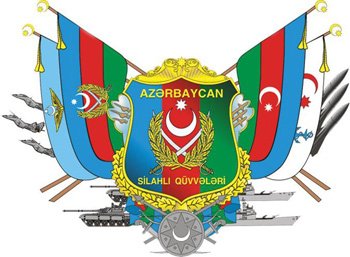 The military ranks of other ministries and agencies of law enforcement structures of the Republic of Azerbaijan mainly coincide with the Land Forces Ranks but only epaulets differ in color. Thus, the sequence of the military ranks in other of law enforcement forces are as follows: sergeant, the senior sergeant, junior lieutenant, lieutenant, senior lieutenant, captain, major, lieutenant-colonel, colonel, major-general, lieutenant-general, lieutenant-colonel.